Warranty starts from DATE OF PURCHASE! PROP 65 WARNING ON ALL PRODUCTS! SEE BELOW FOR MORE SPECIFICS. ORDER: Order by part number and page number. Please give your name, complete address, phone number, payment method, and any other special instructions for your order. PAYMENT: Visa, MasterCard, Discover, Certified Check, or Money Order insures fastest delivery. UPS COD orders will be charged COD fees. Cashier’s check or money order will be required upon delivery of CODs. SHIPPING: Most shipments via UPS ground or USPS priority service. 3-Day Select, 2nd Day Air, and Next Day Air are also available at an additional charge. Customer pays all freight charges. RETURNS: All returns must have an RGA (Return Goods Authorization) number on the outside of the box and be returned within 30 days or they will be refused. Call (864) 848-0601 to obtain an RGA number. All returns are subject to a 15% restocking fee—resalable items only. NO RETURNS AT ANY SHOWS—NO EXCEPTION! If you paint it, mount it, install it—you bought it. Check your order upon receipt, shortages will not be honored after 7 days. Returns must have freight pre-paid. COD returns will be refused. NO RETURN ON SPECIAL ORDERS NOR ELECTRICAL ITEMS. 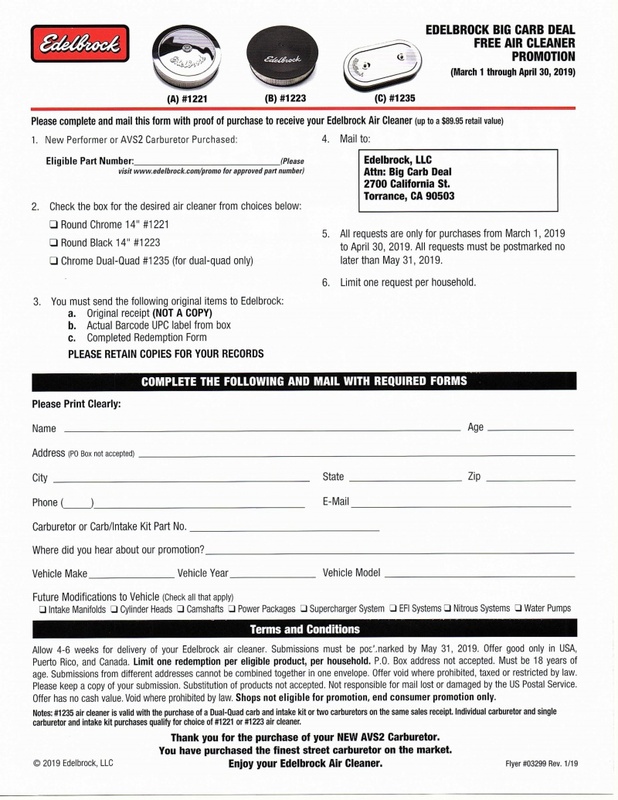 (Keyless entry, wiper motor, etc) Are not refundable unless defective. REFUSED SHIPMENTS: Customers will be charged a 15% handling fee on all refused shipments (plus freight). BACK ORDERS: Orders or portions of orders for merchandise temporarily out of stock will be held on back order and shipped immediately when available. If not received within 60 days, please reorder. Please contact us if you wish to cancel a backorder. LIABILITY: Southern Rods & Parts will not be liable for personal or property damage caused by the use or misuse of any product we manufacturer or sell. Southern Rods & Parts has no control over the installation and/or use of its products. No warranty is expressed or implied. We will repair any product found to be defective, subject to our inspection. RIGHTS RETAINED: Southern Rods & Parts reserves the right to make changes in design or to make additions to or improvements upon any of our products at any time without incurring any obligations whatsoever to install the same or improve upon products previously sold. PRICES: Subject to change without notice. The pricing on our website and in our current catalog supersedes pricing in all other Southern Rods & Parts catalogs or on old web pages. Reproduction of any portion of this catalog without prior written permission is prohibited. Free Shipping 2018 Catalog Sales Promotion: *Shipping cheapest way through UPS Ground or USPS for the continental US ONLY. Free Shipping on items with the blue sticker declaring free shipping. No code necessary. Note Shipping charges apply when item is paired with a non free shipping item. SRP is subject to close promotion at anytime during the 2018 season. CHRISTMAS 2018 Sales Promotion (BLACK FRIDAY): *Shipping cheapest way through UPS Ground or USPS for the continental US ONLY through SRP descresion. 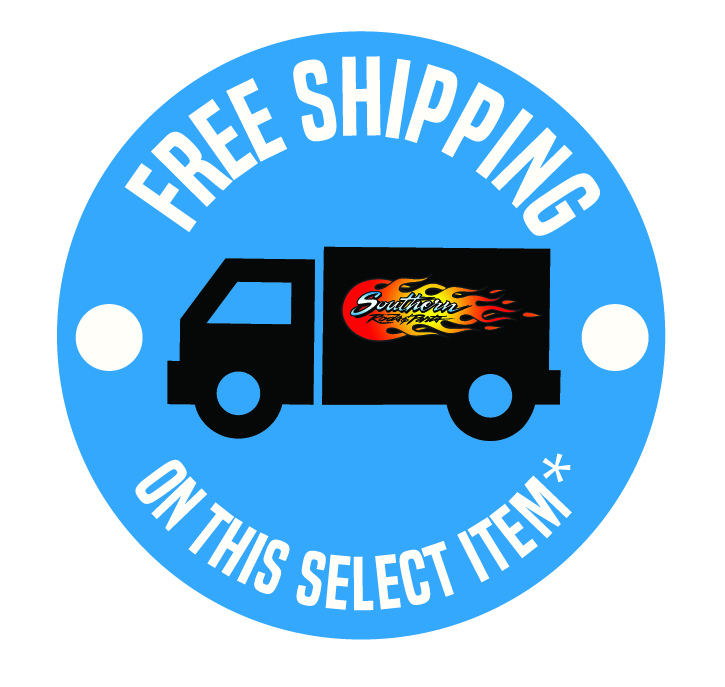 Free Shipping on everything instore to continental US only Lower 48 states. USE CODE: BLACKFRIDAY. Gift cards cannot be exchanged for cash. Only in store credit. Southern Rods has full right to deny sale to items with MAP pricing. Please note we do have a Holley days promotion with 15% those products no code needed. Internet orders and phone orders. Physical store will be closed THURDSAY 22-25th. We will reopen Monday, November 26th. Regular Stocking items will ship the next business day. SRP is subject to close promotion at anytime during the duration of sale or refuse a sale if they do not meet requirements.